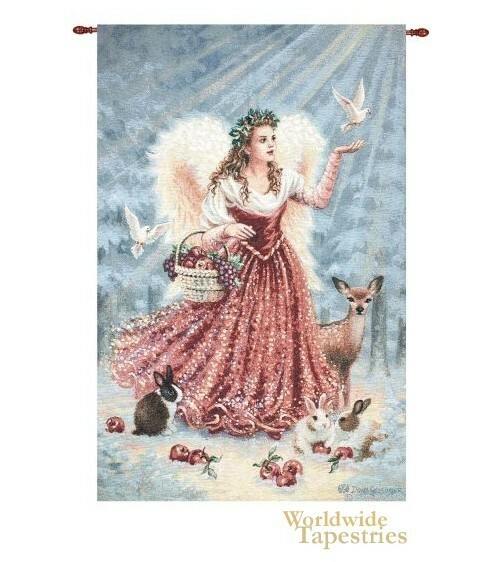 This angel tapestry "Christmas Angel" shows the work of artist Dona Gelsinger. Gelsinger's works are inspiration and beautiful, and many are solely devoted to angels. In this work, we see the Christmas angel giving love and cheer with her hand outstretched to receive a dove, and her other with a basket of lush fruit overflowing to the ground. The snow is on the ground yet the sun is shining on her to illuminate the scene. If you look carefully, you will realise that the setting is of a forest in the snow. A deer, normally a creature that is fearful, is beside her looking directly at the viewer. Rabbits also gather around to enjoy her presence and the apples. The angel's wings are a beautiful bright gold, to match the rest of the beautifully composed work. This angel tapestry "Christmas Angel" is lined and has a tunnel for easy hanging. Note: tapestry rods, where pictured, are not included in the price.